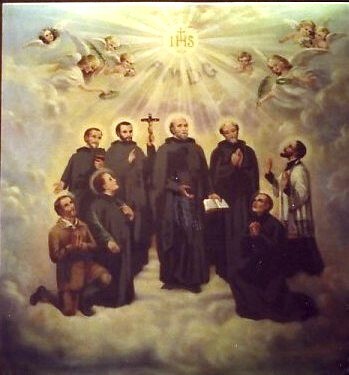 The North American Martyrs were eight Jesuit missionaries from Sainte-Marie among the Hurons, who were martyred in the 17th century in Canada and Upstate New York. 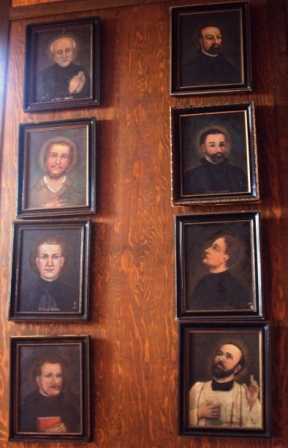 They were canonized by Pope Pius XI in 1930. The Martyrs' Shrine church in Midland, Ontario is the site of their missionary work among the Huron. The National Shrine of the North American Martyrs in Auriesville, New York, along the Mohawk River, is dedicated to them. O God, who inflamed the hearts of your blessed Martyrs with an admirable zeal for the salvation of souls, grant me, I beseech you, my petitions and all the requests recommended here today, (here name your request) so that the favours obtained through their intercession may make manifest before all the power and the glory of your name. Amen. Protect our land, O heavenly patrons, which you have bedewed with the rich treasure of your blood. Watch over our Catholic Faith which you helped to establish in this new land. Bring all our fellow citizens to a knowledge and love of the truth. Make us zealous in spreading abroad a knowledge of Catholic teachings, so that we may continue and perfect the work which you have begun with so much labor and suffering. Pray for our homes, our schools, our missions; for vocations, for the conversion of sinners, the return of those who have wandered from the fold, and the perseverance of all the faithful. Amen.